Don’t pretend Bibi didn’t mean to offend Obama. He is a bully and a liar. Yes, indeed. Netanyahu is clearly a bully and a hypocrite, typical of his political ideology of Zionism. So is Boehner. Is he an ideological Zionist too? It's looking that way. But what really needs to be pointed out and recognized is that ALL of Bibi's complaints and fear-mongering about Iran, and what he states Iran will do, in a classic demonstration of projecting, are offenses and crimes that Israel has committed and continues to commit. Talk about the pot calling the kettle black . . . and as usual threatening to attack (Iran in this case) if America does not agree to Israel's bullying and to do it's bidding. Of course that guilt trip has worked, repeatedly, because folks in U.S. are subject to the fear-mongering extortion, imaging all hell would break loose in the region if Israel did attack . . . in this case, Iran. So Israel provides choices to the U.S., as usual, when it is trying to bully U.S.A. into doing it's bidding: Choice 1) Israel threatens military action (against Iran is this case) if U.S.A. does not do Israel's bidding. Choice 2) U.S. chooses to do Israel's bidding so U.S. can "manage" the situations Israel creates, and prevent Israel from attacking (in this case Iran). It's an established pattern. A very obvious established pattern. Those are the same two choices Israel and it's U.S. PACs always provide U.S. regarding Israel's neighbors. So far that pattern of choices has resulted in our nation being embroiled in military conflict in some way or another with most of Israel's neighbors, and/or in establishing numerous bases, so that Israel does not attack it's neighbors, and in turn be attacked by all of them together. That is what U.S. is repeatedly bullied into "preventing" - this time with Boehner's "blessing" as the "Israel First" dupe that he has proven himself to be. Nope. Huh uh. No. Nothing so unAmerican in my name, Speaker Boehner using mouthpiece Netanyahu. I watched the "circus" in the House on t.v. earlier in the day but missed the introductory remarks, so at first thought it was Bibi's address to AIPAC, instead of his performance in the House. No wonder! The gallery was full of rabble rousing "Israel First" PAC folks leading all the cheering . . . congressional "sheep" following along; but of course, because those same Israel First PAC folks will work hard to get someone else elected if they don't "follow along". Having witnessed his performance it was clear that Bibi's message, openly delivered to the American people, was that "Congress is clearly an occupied territory of Israel." The message Boehner sent is that he believes Israel should have the privilege extended of being considered to be the same as a 51 state of our union. However, no state has been extended the privileges that have been extended to Israel. 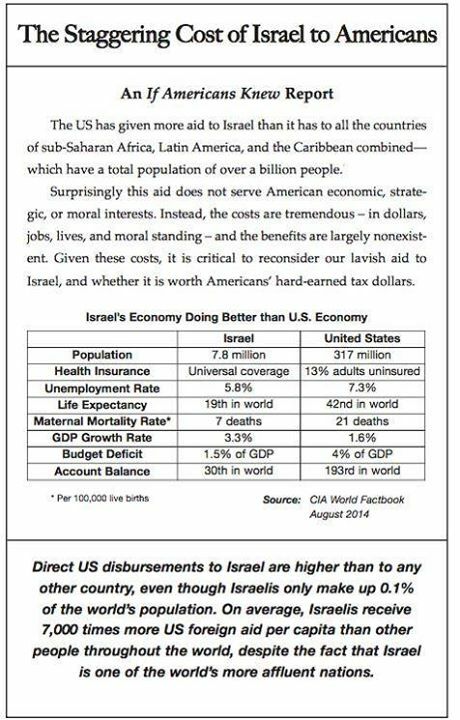 For example, consider "The Staggering Cost of Israel to Americans" from If Americans Knew. Susan Rice talked about American policy prior to Bibi's performance. She said that we can not hold out for "unachievable" outcomes, such as getting Iran to fully end domestic enrichment. "As desirable as that would be, it is neither realistic nor achievable." Truly. But Israel is trying to dictate a different policy for America. The Israeli government keeps Israel in crisis mode so that it always has a crisis reason for trying to dictate to U.S. what we SHOULD do for Israel, by the method of predictably using the extortion of threats; in this case if U.S. doesn't do Israel's bidding, Israel, alone, will attack Iran. But of course American policy is not the same as what Israel wants America to do for Israel's benefit, without regard to any other nation other than Israel. That Boehner apparently thinks so too does not justify him, as Speaker of the House, inviting a head of state to speak in the House of Representatives, along with a full retinue of cheering Israel Firsters, to openly try to extort congress into doing Israel's bidding. Rice actually speaks for the administration when she points out that unachievable outcomes are unrealistic. And they are foolish also. So why didn't Boehner tell the Israeli PAC people and Bibi about choices the U.S. is willing to give Israel instead of inviting Bibi to try to openly extort American policy? Why didn't he say that U.S. policy will be the same regarding a nuclear Israel as it is in regarding a Nuclear Iran? The American policy choices for Israel: Choice 1) If Israel wants an non-nuclear Iran, then Israel will need to go non-nuclear. (But how realistic is that since Israel secretly went nuclear decades ago . . . and still has not agreed to accept oversight as a responsibility of being a nuclear nation?) Choice 2) U.S. policy will accept a nuclear Iran and a nuclear Israel, but does not accept either being able to weaponize. The second choice would be realistic and advisable for Israel to accept. But then when have bullies ever been realistic and open to being advised, especially when they believe they are "more equal"? What remains is U.S. policy that does not support a nuclear weaponize Iran. Boehner does not seem to understand that he, himself, is not THE head of state of our nation. He may be number three in line, but he needs to fulfill the obligations of his own job description and stop trying to fulfill the duties of our president's job description. Although John Boehner may have been pressured by Bibi and AIPAC to invite Bibi to speak, Boehner was wrong to invite a head of state to speak in the House of Representatives. Boehner will always be remembered for his disdain and disrespect of the president. Why else would Bibi imagine it is his place to dictate to U.S. Congress that American policies should be based on what Israel wants. Not only is it offensive and rude, it is unrealistic like Susan Rice stated. Again, all of Bibi's complaints and fear-mongering about Iran are offenses and crimes Israel has committed and continues to commit. As usual it is the double standard attitude that creates and exacerbates problems, causing more unwarranted trouble all the way around which truly does create obstacles on the road that must be taken to arrive at world peace. Could it be that American's are unaware of the way in which Israel repeatedly extorts Congress, behind the scenes? If Boehner thinks so then perhaps there was "method to his madness" so he manipulated Bibi into doing so openly in Congress? It's doubtful. But perhaps Boehner believes more in the astuteness of we, the people, than we know. Except that he repeatedly displays so much disdain for our president is it difficult to imagine he has no less disdain for we, the people. How fortunate we are that President Obama does not take intentional insults personally. Very clearly Boehner's insults say far more about his own egotistical bullying - and Bibi's - or course, than they say about our president - and none of it is good, none of it.